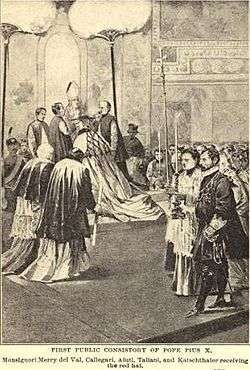 First public consistory of Pope Pius X. In the Roman Catholic Church a consistory is a formal meeting of the College of Cardinals called by the Pope. Consistories serve as an opportunity for the Pope to elevate new Cardinals to the college. A meeting of the College of Cardinals to elect a new Pope is called a conclave. The term "consistory" comes from the Latin: con-sistere; "stand together". Early popes conferred with their Roman presbytery which included the deacons appointed to oversee different parts of Rome. This tradition continued as deacons were replaced with cardinals and those cardinals (from among whom the pope was chosen) continued to meet at the request of successive popes. Consistories became an opportunity for the pope to decide matters of state and dispense justice directly, with the support and advice of Roman bishops and those bishops from other regions who happened to be in Rome. Pope Leo IV ordered that consistories be held twice weekly. Pope John VIII relaxed that edict slightly and an order of twice-monthly consistories. With the Gregorian Reform, the Church limited outside influences on the papacy and the selection of popes and the power of cardinals increased. Tradition developed that the pope would use consistories (closer to twice-yearly by the 17th century) to reveal a list of those that were to be elevated to the rank of cardinal. Eventually, responsibility for matters of justice was transferred to the Roman Rota and the functions of the Church were transferred to the Roman Curia reducing the need for regular consistories. Subsequently, consistories became primarily ceremonial in function. Consistories allow the Pope to create new cardinals in the presence of the college. The identities of the cardinals-to-be are generally announced some time in advance, but only at the time of the consistory does the elevation to the cardinalate take effect, since that is when the Pope formally publishes the decree of elevation. Some men have died before the consistory date, and if a Pope dies before the consistory all the nominations are voided. The cardinal, however, does not have to attend the consistory for his elevation to be effective. For example, Bishop John Fisher was imprisoned by King Henry VIII on 26 April 1534. A year later, in May 1535, Pope Paul III created Fisher a cardinal. King Henry, however, forbade the cardinal's hat to be brought into England, declaring that he would send the head to Rome instead. Cardinal Fisher was beheaded a month later on 22 June. New cardinals present are presented with their rings, zucchetti (small skullcaps), and birette (four-cornered silk hats) by the Pope. Formerly they also received an elaborate broad-brimmed tasseled hat, the galerum rubrum, at the ceremony, but Pope Paul VI abolished this in 1967 and those cardinals who want these obtain them privately from a maker in Rome. The zucchetto, the biretta, and the galerum rubrum are all scarlet, the distinctive color of cardinals' vesture. When a diocesan cardinal dies, his galerum rubrum is suspended from the ceiling of his cathedral. At the consistory cardinals are generally assigned titular churches in the diocese of Rome, though Pope Paul VI abolished their functional involvement in the governance of these churches; the cardinals formally "take possession" of these churches at a later date. Consistories are also an opportunity for cardinals to raise matters directly with the Pope. Pope Francis held the most recent papal consistory on November 19, 2016. It was also reported that consistories and receptions which follow would no longer be held in the Apostolic Palace. Instead, the consistory took place in Saint Peter's Basilica. Afterwards, the Pope and the Cardinals visited the home of Pope Emeritus Benedict XVI, in a former convent inside the Vatican. People from different regions of the world were also allowed to receive a blessing from their local cardinal at Paul VI Audience Hall. Prior to that, the next most recent consistory for the creation of new Cardinals took place on 14 February 2015 during which Pope Francis elevated 20 new cardinals. Among those who attended was Pope emeritus Benedict XVI. ↑ Code of Canon Law Canon 353. Wikimedia Commons has media related to Papal consistories. "Consistory". Encyclopædia Britannica (11th ed.). 1911.